This post will be a modified backtest of the Adaptive Asset Allocation backtest from AllocateSmartly, using the Hierarchical Risk Parity algorithm from last post, because Adam Butler was eager to see my results. On a whole, as Adam Butler had told me he had seen, HRP does not generate outperformance when applied to a small, carefully-constructed, diversified-by-selection universe of asset classes, as opposed to a universe of hundreds or even several thousand assets, where its theoretically superior properties result in it being a superior algorithm. First off, I would like to thank one Matthew Barry, for helping me modify my HRP algorithm so as to not use the global environment for recursion. You can find his github here. Here is the modified HRP code. With covMat and corMat being from the last post. In fact, this function can be further modified by encapsulating the clustering order within the getRecBipart function, but in the interest of keeping the code as similar to Marcos Lopez de Prado’s code as I could, I’ll leave this here. Anyhow, the backtest will follow. One thing I will mention is that I’m using Quandl’s EOD database, as Yahoo has really screwed up their financial database (I.E. some sector SPDRs have broken data, dividends not adjusted, etc.). While this database is a $50/month subscription, I believe free users can access it up to 150 times in 60 days, so that should be enough to run backtests from this blog, so long as you save your downloaded time series for later use by using write.zoo. This code needs the tseries library for the portfolio.optim function for the minimum variance portfolio (Dr. Kris Boudt has a course on this at datacamp), and the other standard packages. A helper function for this backtest (and really, any other momentum rotation backtest) is the appendMissingAssets function, which simply adds on assets not selected to the final weighting and re-orders the weights by the original ordering. Next, we make the call to Quandl to get our data. # quandl command to download from EOD database. Free users should use write.zoo in this loop. While Josh Ulrich fixed quantmod to actually get Yahoo data after Yahoo broke the API, the problem is that the Yahoo data is now garbage as well, and I’m not sure how much Josh Ulrich can do about that. I really hope some other provider can step up and provide free, usable EOD data so that I don’t have to worry about readers not being able to replicate the backtest, as my policy for this blog is that readers should be able to replicate the backtests so they don’t just nod and take my word for it. If you are or know of such a provider, please leave a comment so that I can let the blog readers know all about you. Next, we initialize the settings for the backtest. While the AAA backtest actually uses a 126 day lookback instead of a 6 month lookback, as it trades at the end of every month, that’s effectively a 6 month lookback, give or take a few days out of 126, but the code is less complex this way. Next, we have our actual backtest. 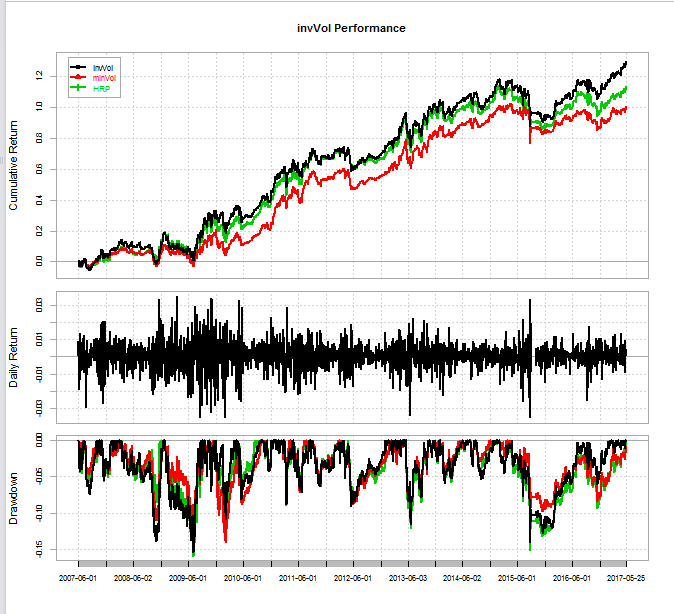 The algorithm takes a subset of the returns (the past six months at every month), and computes absolute momentum. It then ranks the ten absolute momentum calculations, and selects the intersection of the top 5, and those with a return greater than zero (so, a dual momentum calculation). If no assets qualify, the algorithm invests in nothing. If there’s only one asset that qualifies, the algorithm invests in that one asset. If there are two or more qualifying assets, the algorithm computes a covariance matrix using 20 day volatility multiplied with a 126 day correlation matrix (that is, sd_20′ %*% sd_20 * (elementwise) cor_126. 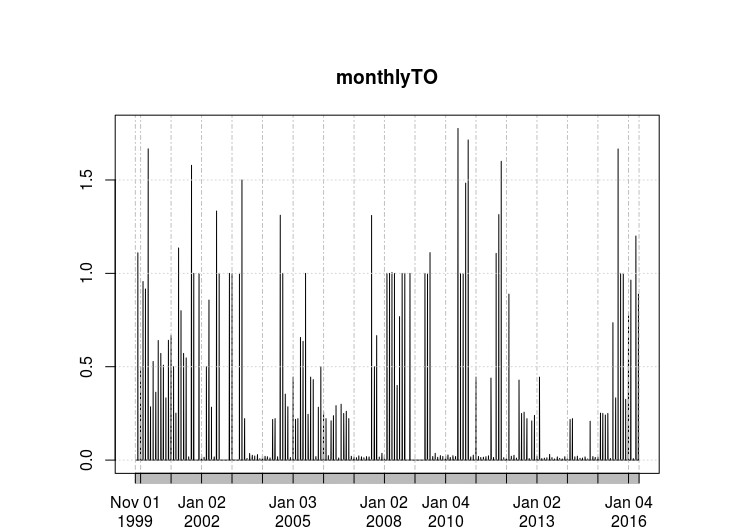 It then computes normalized inverse volatility weights using the volatility from the past 20 days, a minimum variance portfolio with the portfolio.optim function, and lastly, the hierarchical risk parity weights using the HRP code above from Marcos Lopez de Prado’s paper. Lastly, the program puts together all of the weights, and adds a cash investment for any period without any investments. In short, in the context of a small, carefully-selected and allegedly diversified (I’ll let Adam Butler speak for that one) universe dominated by the process of which assets to invest in as opposed to how much, the theoretical upsides of an algorithm which simultaneously exploits a covariance structure without needing to invert a covariance matrix can be lost. However, this test (albeit from 2007 onwards, thanks to ETF inception dates combined with lookback burn-in) confirms what Adam Butler himself told me, which is that HRP hasn’t impressed him, and from this backtest, I can see why. However, in the context of dual momentum rank selection, I’m not convinced that any weighting scheme will realize much better performance than any other. NOTE: I am always interested in networking and hearing about full-time opportunities related to my skill set. My linkedIn profile can be found here. This post will be about replicating the Marcos Lopez de Prado algorithm from his paper building diversified portfolios that outperform out of sample. This algorithm is one that attempts to make a tradeoff between the classic mean-variance optimization algorithm that takes into account a covariance structure, but is unstable, and an inverse volatility algorithm that ignores covariance, but is more stable. This is a paper that I struggled with until I ran the code in Python (I have anaconda installed but have trouble installing some packages such as keras because I’m on windows…would love to have someone walk me through setting up a Linux dual-boot), as I assumed that the clustering algorithm actually was able to concretely group every asset into a particular cluster (I.E. ETF 1 would be in cluster 1, ETF 2 in cluster 3, etc.). Turns out, that isn’t at all the case. Here’s how the algorithm actually works. First off, it computes a covariance and correlation matrix (created from simulated data in Marcos’s paper). Next, it uses a hierarchical clustering algorithm on a distance-transformed correlation matrix, with the “single” method (I.E. friend of friends–do ?hclust in R to read up more on this). The key output here is the order of the assets from the clustering algorithm. Note well: this is the only relevant artifact of the entire clustering algorithm. Initialize a vector of weighs equal to 1 for each asset. 1) Break the order vector up into two equal-length (or as close to equal length) lists as possible. 2) For each half of the list, compute the inverse variance weights (that is, just the diagonal) of the covariance matrix slice containing the assets of interest, and then compute the variance of the cluster when multiplied by the weights (I.E. w’ * S^2 * w). 3) Then, do a basic inverse-variance weight for the two clusters. Call the weight of cluster 0 alpha = 1-cluster_variance_0/(cluster_variance_0 + cluster_variance_1), and the weight of cluster 1 its complement. (1 – alpha). 4) Multiply all assets in the original vector of weights containing assets in cluster 0 with the weight of cluster 0, and all weights containing assets in cluster 1 with the weight of cluster 1. That is, weights[index_assets_cluster_0] *= alpha, weights[index_assets_cluster_1] *= 1-alpha. 5) Lastly, if the list isn’t of length 1 (that is, not a single asset), repeat this entire process until every asset is its own cluster. Here is the implementation in R code. First off, the correlation matrix and the covariance matrix for use in this code, obtained from Marcos Lopez De Prado’s code in the appendix in his paper. This reads in the two matrices above and gets the clustering order. Next, my code diverges from the code in the paper, because I do not use the list comprehension structure, but instead opt for a recursive algorithm, as I find that style to be more readable. One wrinkle to note is the use of the double arrow dash operator, to assign to a variable outside the scope of the recurFun function. I assign the initial weights vector w in the global environment, and update it from within the recurFun function. I am aware that it is a faux pas to create variables in the global environment, but my attempts at creating a temporary environment in which to update the weight vector did not produce the updating mechanism I had hoped to, so a little bit of assistance with refactoring this code would be appreciated. Lastly, let’s run the function. So, hopefully this democratizes the use of this technology in R. While I have seen a raw Rcpp implementation and one from the Systematic Investor Toolbox, neither of those implementations satisfied me from a “plug and play” perspective. This implementation solves that issue. Anyone here can copy and paste these functions into their environment and immediately make use of one of the algorithms devised by one of the top minds in quantitative finance. A demonstration in a backtest using this methodology will be forthcoming. NOTE: I am always interested in networking and full-time opportunities which may benefit from my skills. Furthermore, I am also interested in project work in the volatility ETF trading space. My linkedin profile can be found here. This post will introduce component conditional value at risk mechanics found in PerformanceAnalytics from a paper written by Brian Peterson, Kris Boudt, and Peter Carl. This is a mechanism that is an easy-to-call mechanism for computing component expected shortfall in asset returns as they apply to a portfolio. While the exact mechanics are fairly complex, the upside is that the running time is nearly instantaneous, and this method is a solid tool for including in asset allocation analysis. For those interested in an in-depth analysis of the intuition of component conditional value at risk, I refer them to the paper written by Brian Peterson, Peter Carl, and Kris Boudt. Essentially, here’s the idea: all assets in a given portfolio have a marginal contribution to its total conditional value at risk (also known as expected shortfall)–that is, the expected loss when the loss surpasses a certain threshold. For instance, if you want to know your 5% expected shortfall, then it’s the average of the worst 5 returns per 100 days, and so on. For returns using daily resolution, the idea of expected shortfall may sound as though there will never be enough data in a sufficiently fast time frame (on one year or less), the formula for expected shortfall in the PerformanceAnalytics defaults to an approximation calculation using a Cornish-Fisher expansion, which delivers very good results so long as the p-value isn’t too extreme (that is, it works for relatively sane p values such as the 1%-10% range). Component Conditional Value at Risk has two uses: first off, given no input weights, it uses an equal weight default, which allows it to provide a risk estimate for each individual asset without burdening the researcher to create his or her own correlation/covariance heuristics. Secondly, when provided with a set of weights, the output changes to reflect the contribution of various assets in proportion to those weights. This means that this methodology works very nicely with strategies that exclude assets based on momentum, but need a weighting scheme for the remaining assets. Furthermore, using this methodology also allows an ex-post analysis of risk contribution to see which instrument contributed what to risk. First, a demonstration of how the mechanism works using the edhec data set. There is no strategy here, just a demonstration of syntax. This will assume an equal-weight contribution from all of the funds in the edhec data set. The salient part of this is the percent contribution (the last output). Notice that it can be negative, meaning that certain funds gain when others lose. At least, this was the case over the current data set. These assets diversify a portfolio and actually lower expected shortfall. In this case, I equally weighted the first ten managers in the edhec data set, and put zero weight in the last three. Furthermore, we can see what happens when the weights are not equal. This time, notice that as the weight increased in the convertible arb manager, so too did his contribution to maximum expected shortfall. For a future backtest, I would like to make some data requests. I would like to use the universe found in Faber’s Global Asset Allocation book. That said, the simulations in that book go back to 1972, and I was wondering if anyone out there has daily returns for those assets/indices. While some ETFs go back into the early 2000s, there are some that start rather late such as DBC (commodities, early 2006), GLD (gold, early 2004), BWX (foreign bonds, late 2007), and FTY (NAREIT, early 2007). As an eight-year backtest would be a bit short, I was wondering if anyone had data with more history. One other thing, I will in New York for the trading show, and speaking on the “programming wars” panel on October 6th. NOTE: While I am currently contracting, I am also looking for a permanent position which can benefit from my skills for when my current contract ends. If you have or are aware of such an opening, I will be happy to speak with you. This post will demonstrate how to take into account turnover when dealing with returns-based data using PerformanceAnalytics and the Return.Portfolio function in R. It will demonstrate this on a basic strategy on the nine sector SPDRs. So, first off, this is in response to a question posed by one Robert Wages on the R-SIG-Finance mailing list. While there are many individuals out there with a plethora of questions (many of which can be found to be demonstrated on this blog already), occasionally, there will be an industry veteran, a PhD statistics student from Stanford, or other very intelligent individual that will ask a question on a topic that I haven’t yet touched on this blog, which will prompt a post to demonstrate another technical aspect found in R. This is one of those times. 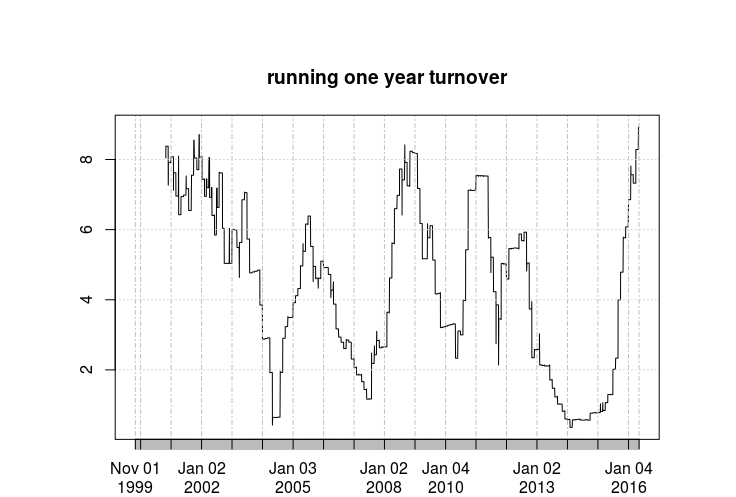 So, this demonstration will be about computing turnover in returns space using the PerformanceAnalytics package. 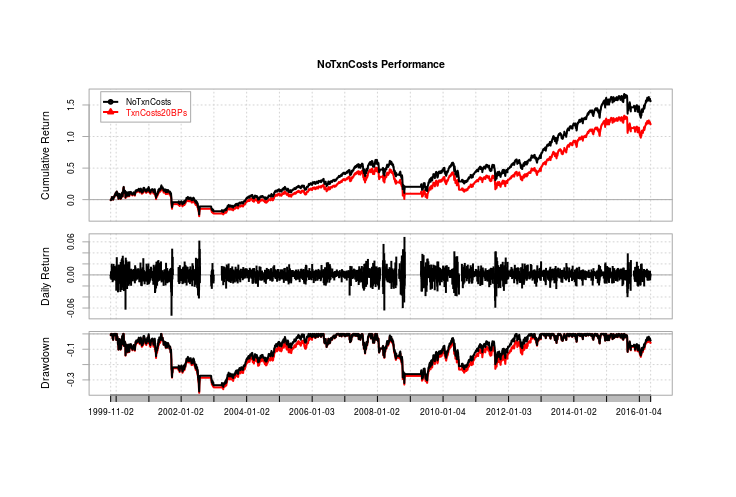 Simply, outside of the PortfolioAnalytics package, PerformanceAnalytics with its Return.Portfolio function is the go-to R package for portfolio management simulations, as it can take a set of weights, a set of returns, and generate a set of portfolio returns for analysis with the rest of PerformanceAnalytics’s functions. Again, the strategy is this: take the 9 three-letter sector SPDRs (since there are four-letter ETFs now), and at the end of every month, if the adjusted price is above its 200-day moving average, invest into it. Normalize across all invested sectors (that is, 1/9th if invested into all 9, 100% into 1 if only 1 invested into, 100% cash, denoted with a zero return vector, if no sectors are invested into). It’s a simple, toy strategy, as the strategy isn’t the point of the demonstration. So, get the SPDRs, put them together, compute their returns, generate the signal, and create the zero vector, since Return.Portfolio treats weights less than 1 as a withdrawal, and weights above 1 as the addition of more capital (big FYI here). So, the trick is this: when you call Return.portfolio, use the verbose = TRUE option. This creates several objects, among them returns, BOP.Weight, and EOP.Weight. These stand for Beginning Of Period Weight, and End Of Period Weight. The way that turnover is computed is simply the difference between how the day’s return moves the allocated portfolio from its previous ending point to where that portfolio actually stands at the beginning of next period. That is, the end of period weight is the beginning of period drift after taking into account the day’s drift/return for that asset. The new beginning of period weight is the end of period weight plus any transacting that would have been done. Thus, in order to find the actual transactions (or turnover), one subtracts the previous end of period weight from the beginning of period weight. This is what such transactions look like for this strategy. This essentially means that one year’s worth of two-way turnover (that is, if selling an entirely invested portfolio is 100% turnover, and buying an entirely new set of assets is another 100%, then two-way turnover is 200%) is around 800% at maximum. That may be pretty high for some people. Now, here’s the application when you penalize transaction costs at 20 basis points per percentage point traded (that is, it costs 20 cents to transact $100). So, at 20 basis points on transaction costs, that takes about one percent in returns per year out of this (admittedly, terrible) strategy. This is far from negligible. So, that is how you actually compute turnover and transaction costs. In this case, the transaction cost model was very simple. However, given that Return.portfolio returns transactions at the individual asset level, one could get as complex as they would like with modeling the transaction costs. NOTE: I will be giving a lightning talk at R/Finance, so for those attending, you’ll be able to find me there.